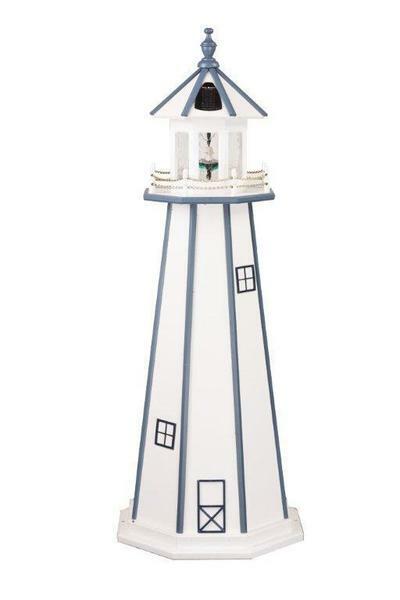 Been looking for the perfect lighthouse for your garden, dock, or entryway? Look no further! This beautifully handcrafted lighthouse is completely customizable, with a huge range of options for its color, its light, and its size. No matter what you choose, every piece will be proudly handcrafted by expert woodworkers at a family-owned woodshop in Pennsylvania. The care and attention to detail guaranteed in every one of these wonderful lighthouses means that they can promise years upon years of enjoyment wherever they go. Choose your ideal options from the menus above. If you have any questions at all about this garden lighthouse, please don't hesitate to get in touch - we would love to hear from you. You can also visit us at our Sarasota, Florida store to see our lighthouses in person.